We were getting the train over to pushkar at 7am, therefore we were suppose to get up at 5am, to have showers and pack. Luckily I woke up and checked the time, we had both slept through our alarms, and it was 6am! We literally threw everything in our cases, and went to the station, and luckily we got there with time to spare! We then got into Ajmer station and got a taxi to Pushkar. Our hostel was amazing, it was a family run place, the wife was a lady from the UK who had gone traveling and fallen in love with an Indian guy, and stayed and got married, and they now have 2 kids. I thought it was kind of amazing. Pushkar itself was werid. It's suppose to be one of the holiest places in India, as in Hinduism, the creator Brahma, dropped 3 lotus leaves which turned into the lakes at Pushkar and meant Pushkar was the first place ever created. But although its really holy, holy people don't think twice about trying to scam you out of your money. We went down to the lake and were made to do the holy ceremony to bless you and your family. It was a nice ceremony, but the whole time your thinking, when does the money bit come in. Once they finish the ceremony they put a bracelet on you which is known locally as a "pushkar passport" which means the other holy people will leave you alone as they know you have done the ceremony. After the ceremony you then have to argue a price, and then escape. The second day we were there we went on a camel safari, which is one of the best experiences I have had in India. The guys picked us up with 2 camels, one Andy got on, and the other was pulling a cart which I got into. We then went along into the desert. We then swapped and I rode the camel and directed it with a harness. My camel was called slowmo. And every so often one of the guys had to chase slowmo so he would hurry up. When slowmo ran it was horrible as there wasn't much to hold onto and I almost fell off! We went through farms, where the people were still living as they would have done for century's and then came to our sleeping place, where we lay blankets out, and then helped to peel garlic for our food. The guys made us food which was delicious, and a type of bread which they buried into the hot coals to cook, which was very heavy and dense. We then lay under the stars and saw shooting stars and sang songs together. It was all very lovely, until the stray dogs we fed to leftovers too decided we were its new best friends and came and sat on me through the night. It stayed with us all night and then in the morning followed us back to town. We affectionately called him mangey. On the way back we both rode one camel, which meant I only had Andy to hold onto. We then walked through the town on camel back, along roads (which felt abit ridiculous!) With our mangey friend following us and getting into fights with other dogs along the way. 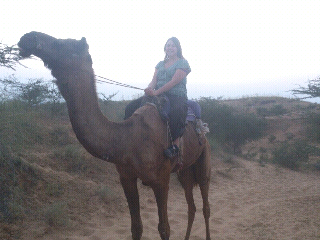 I absolutely loved the camel trek though and totally think everyone should have ago! At it! We were then dropped off in our hostel before getting a train onto Jaipur!